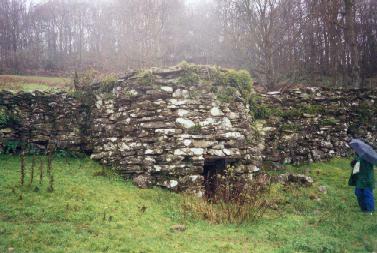 The typical Potash Kiln is stoutly made of large blocks of drystone walling built into the side of a bank and close to an ancient trackway. Occasionally it stands alone in a small and ancient close on the lower fellside; or it may be found outside the ancient head-dyke walls close to where a sheepgate runs up onto the fells. The area is always thick with brackens, either in the fields or along beck-sides etc.. When complete, a kiln will stand about 8-9.5ft/3m high at the front at the draught-hole, but level with the fellside at the rear of the circular pit. The wall tops are 3ft/1m thick at the rear, widening to about 4ft/1.5m at the front. Both exterior and interior walls display a batter, so that a progressively-dismantled kiln shows ever-thickening walls. At ground level, lateral walls are about 6.5ft/2m wide, and the front wall 7-10ft/2-3.5m. A well-kept and cleared-out kiln has a red-burnt inner wall, especially on its lower sides, but there is no sign of slagging. (Any slagging or blistering indicates that lime was burnt in the kiln). The floor is composed of flat stones and clay. These kilns are first mentioned in records of Cistercian monasteries (such as Furness or Holm Cultram) of the 12th century. Such early kilns were very large and burnt dead wood or twigs at that time. Monastic wealth came partially from the mining and smelting of metal ores, and partially from their sheep flocks and the sales of fleeces to Flemish weavers in Flanders. But in the 14th century Edward III initiated a series of Acts to make it more worthwhile for English Woolmen to make up their own woollen goods at home and then sell abroad for greater profits. At about the same time, one result of the decimation of the population by the Black Death caused laws of supply and demand to force up prices of clothing to the point where the working people complained to the king. He eventually made laws decreeing the types of clothing that each class could wear, and the price of the cloths. The larger mass of people had to wear Russet, Blanquet, Serge, Duffel, etc. – all well made and brightly coloured because northern Dyers could wash the woollens completely clean using potash soaps, and then colour and fix the dyes using mordants like potash and alum. Green became a very popular colour. The Kendal area became famous as the marketing centre for the dyeing trades. The kilns burnt green bracken from as early as the late 15th century, making POT-ASH! These were then mixed with burnt lime and with tallow and boiled to make soft liquid soaps that are still called lyes today. By Henry VIII’s time, kilns were commonly called Elyeing Hearths, and owners were rich enough to climb out of the lower working class level. Tithe maps yield field names such as Kiln Close, Milkin, Kelbarrow, Elinghearth, Ellin-garth, Walkmill Close, Tenterbank and Brackenrigg. One usually finds a group of such names in a small area, and less than 30 minutes search will yield a kiln within 50yds/45m of the kiln-named field. Recent analysis of field-names and kilns by this author has proved a clear relationship between the locations of places where kilns are found; the bracken banks from which fronds were cut; the stepped field strips where the soap-cleaned cloths were dried (tenterbanks); the so-called Walk Mill (though water-powered from the 11th century in Lakeland); and the prevailing wind direction for that area. This author calls this a consociation pattern. A remarkably identical sequence of these can be seen throughout North-West Britain’s mountainous districts, from Wales to the Pennines, the whole of Western and Northern Scotland, and to Ireland. It proves that potash burning was part of a large medieval woollens manufacturing team of about 100 Spinsters, Websters, Dyers, Fullers, Tenterers, Croppers, Shearmen, Ashburners, Packmen, Bowkers and Mercers using one fulling mill with one kiln. In the 18th century, such teams had expanded and also used big water-powered carding mills, but still used potashes made in the old way, until about 1840 in Lakeland but about 1925 in the Scottish Trossachs.